This album should have been called �The John Williams Show�. He has seven compositions in a total of eleven, although admittedly six of them are from his score for the film Star Wars. We are talking here, of course of John Tower Williams the American composer and not John Williams, the classical guitarist and sometime-rock-band-leader, we in Australia claim as our own because he was born in Melbourne although he�s lived most of his life in Britain. Certainly both need no introduction. However the Williams we are concerned with has more than one bow to his ukulele, he also conducts and has composed two symphonies, a violin concerto, a flute concerto as well as the fanfare used in the 1984 Los Angeles Olympic Games. Of course, he is better known for his film scores and they are as plentiful as they are varied in thematic quality. There is the grinding look-over-your-shoulder theme for Jaws, the adventurous themes for Raiders of the Lost Ark and Indiana Jones and the Temple of Doom, the orientally haunting Empire of the Sun and many more for which Williams has received more than a handful of Oscars and BAFTAs. He won the 1982 Oscar and BAFTA award for his score of ET - The Extra Terrestrial. Having said all that his most famous compositions are the ones for the Star Wars episodes. He is joined on this album by American composers who have also scored music for award-winning science fiction films. The list includes a jazzed-up arrangement of Richard Strauss�s much-used cameo from his 1896 tone poem Also sprach Zarathustra which featured in Stanley Kubrick�s 2001: A Space Odyssey. Frankly, this album could have well done without the Richard Hayman arrangement. Many have tried but no one has yet managed to improve on the original. In fact the majority of the inclusions on this album leaves one wondering why they were originally recorded in 1989 let alone re-issued this year. Except for the question of budget pricing and the fact that these sci-fi themes have been collated in one album, the originals I have heard are streets ahead in terms of quality and presentation. 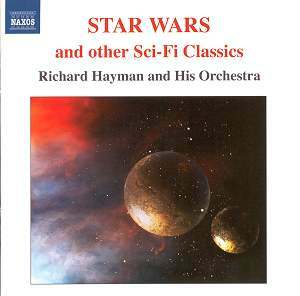 Even the latest release on Decca of Zubin Mehta and the Los Angeles Philharmonic�s version of Star Wars Suite has more immediacy and clarity. Perhaps the best on this Naxos recording is Williams�s theme from his Close Encounters of the Third Kind. Hayman�s version is suitably haunting and compact. The rest left me wishing I was enveloped by the silence of space. One other small point. I am a great admirer of what Klaus Heymann and his Naxos ideal of bringing the best in budget-priced CDs to the world. But I wish the dates they print were double-checked a bit more thoroughly. For example, the albums comprising Sir John Tavener�s music have him born in 1945 � he was born in 1944 � and in this album they show John Williams being born in 1937 when all my records show his date of birth as 1932. It�s all enough to age you prematurely.